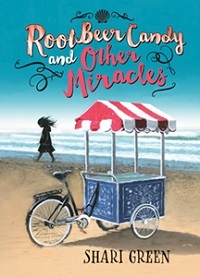 CM Magazine: Root Beer Candy and Other Miracles. Root Beer Candy and Other Miracles. 239 pp., trade pbk., $11.95. after she and Dad fight. Eleven-year-old Bailey longs for miracles. She and her younger brother are spending a month on Arbutus Island with a spoon-stealing grandmother they haven�t previously met while their parents are at Marriage Repair camp. As Bailey�s new friend Daniel, a boy with cystic fibrosis, demonstrates his capacity to live in the present, Bailey learns to think about things she can change, and things she can�t, in a more mature and positive way. Family secrets, as well as unique and complex characterizations, make this a light-hearted yet evocative page-turner. Told in verse-novel form, Green�s writing is captivatingly visual, with seamless inclusions of figurative language. As with many other verse-novels, a first-person narrative, told from the present tense, makes the story immediate and compelling, versatile as independent reading or as an engaging read-aloud. Choices in formatting add to the text�s readability, extending it to a wider than typical age and ability range. The varied line lengths support comprehension, with wide indenting and use of italics to identify dialogue, as well as extra spacing between speakers. Onomatopoeia is flush left and italicized. In addition to these helpful cues, imagined speeches between Bailey and a piece of driftwood she has personified occur in playscript style. Bev Brenna, a literacy professor at the University of Saskatchewan, has 10 published books for young people.